The IBTrACS global best track data set endorsed by the World Meteorological Organization provides a valuable global record of tropical cyclone genesis, track and intensity, and spans 1842 to the present. The record is significantly more robust from the late 1970s onwards, as it is supported by satellite imagery. These records indicate that the first tropical cyclone in the South Indian Ocean to intensify to CAT5 status did so in 1994. This date is significantly later than the first CAT5 storms recorded in the IBTrACS database for the Atlantic Ocean (1924) and the North Pacific (1951) recorded from ship records, and half a decade later than those of the North Indian Ocean (1989) and South Pacific (1988), captured from satellite imagery. Following this late emergence, in the period 1990-2000, eight CAT5 tropical cyclones were recorded for the South Indian Ocean. A further four have been recorded for the period 2010-2015. This recent emergence of tropical cyclones attaining category five intensity in the South Indian Ocean is of significance for the forecasting of tropical cyclone landfall and the anticipation of storm damage for the developing economies that characterise the region. Although an increase in tropical cyclone intensity is frequently projected under global climate change scenarios, the dynamics for the South Indian Ocean have remained poorly understood. Notable are early results indicating an increased frequency and poleward migration of these CAT5 storms, concurrent with a poleward migration in the position of the 26.5 °C, 28 °C and 29 °C sea surface temperature isotherms in the South Indian Ocean. •Category 5 tropical cyclones, the strongest category of storms, have only recently emerged in the South Indian Ocean. Since 1989, their frequency of occurrence has increased. This increase poses a heightened risk of storm damage for the South Indian Ocean Island States and the countries of the southern African subcontinent as a result of the strong winds, heavy rainfall and storm surges associated with these storms, and the large radial extent at category 5 strength. This study reflects on the emergence of tropical cyclones in the IBTrACS record for the South Indian Ocean in 1994, and the changing dynamics of these storms over the past two decades, including changes in the number of CAT5 storms, the latitudinal positions of the storms, and the underlying sea surface temperatures as drivers of cyclogenesis. Storm track records for the South Indian Ocean were explored using the NOAA Unisys IBTrACS record (https://www.ncdc.noaa.gov/ibtracs/index.php?name=ibtracs-data). The data were explored for the period commencing on 1 June 1970 to avoid issues of data heterogeneity for earlier records which were compiled from ship logs, coastal records and a sparse distribution of aerial reconnaissance data, rather than satellite imagery used from 1970 onwards.8,25 The compiled record terminated in 2015. The Unisys advanced filter tool was used to isolate all storms that were classified as CAT5 to determine the total decadal count of storms in each category, and the year of the first record of CAT5 storms in each ocean basin. 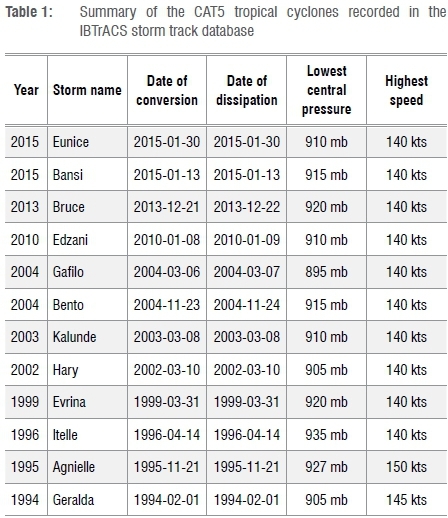 The wind speed and central pressure of each CAT5 storm were checked in the Unisys record for the time period for which each storm was classified at CAT5 to ensure that no miscategorisation had occurred. For each storm that had attained CAT5 strength, the latitudes and longitudes of the conversion from tropical storm to CAT1 tropical cyclone, of the conversion from CAT4 to CAT5 tropical cyclone, and of the downgrade from CAT5 storm to CAT4 or lower were manually extracted together with the date of each event. The latitudes of the conversion into and dissipation from category 5 was plotted for each storm relative to the month and year of the respective events, with time-trend calculated using linear regression. Sea surface data were obtained from the NOAA Extended Reconstructed SST V4 GrADS images (https://www.esrl.noaa.gov/psd/data/gridded/data.noaa.ersst.html). 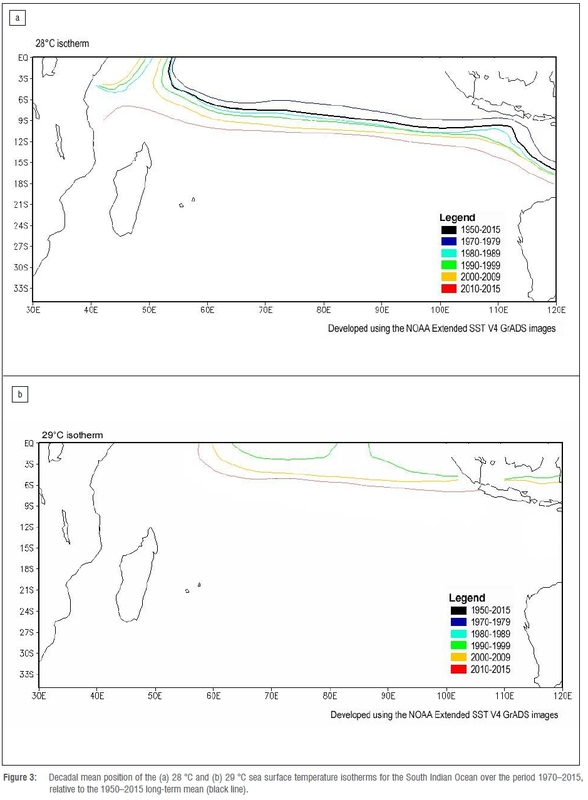 Images were constrained geographically for the South Indian Ocean, between 0-30°S and 30-120°E, with sea surface isotherms plotted at 0.5-°C intervals. Composite plots were calculated from mean annual sea surface temperature isotherms for a long-term mean spanning 1950-2015, for decadal means for the period 1970-2009, and for the most recent half decade of tropical cyclone storm track data, 2010-2015. From these plots, the 26.5 °C and 28 °C isotherms were extracted and re-plotted to explore trends in isotherm shift of the period 1970-2015. From these plots the rate of change in the position of each isotherm was calculated at 10° longitude intervals, and averaged for the ocean basin. Weekly mean sea surface isotherm plots were obtained from NOAA V2 sea surface temperature record (https://www.esrl.noaa.gov/psd/data/gridded/data.noaa.oisst.v2.html) for the dates of each of the CAT5 tropical cyclones identified from the IBTrACS record. Two plots were generated for each time period: the first geographically constrained by the coordinate position of the storm from conversion to CAT1 through to the location of dissipation from CAT5 and the second for the entire ocean basin. From these plots, the sea surface temperature on the date and at the geographical position of the storm track on conversion to CAT1 storm, and conversion to and dissipation from CAT5 storm were extracted, together with the mean latitudinal position of the 28 °C isotherm for the South Indian Ocean basin. The first tropical cyclone classified as attaining CAT5 intensity in the South Indian Ocean is recorded in the IBTrACS record for February 1994. This date is considerably later than the first CAT5 tropical cyclones recorded in the same database for the Atlantic Ocean (1924) and the North Pacific (1951), which would have been detected from ship or coastal records. It is also half a decade later than the first CAT5 tropical cyclones recorded for the North Indian Ocean (1989) and South Pacific (1988) in the IBTrACS database. Although it could be argued that CAT5 tropical cyclones in regions of lower population density may have gone unnoticed in the early 19th century, the latter two records would have detected them by satellite imagery that provides a more globally equivalent database for all ocean basins from the 1970s onwards. While this record has been improved by direct monitoring through geo-stationary satellites16, it is unlikely that all CAT5 storms went undetected prior to this advancement. Thereafter, four CAT5 tropical cyclones were recorded for the decadal periods 1990-1999 and 2000-2009. For the remaining 5 years captured in the data set from 2010 to 2015, a further four CAT5 storms are recorded. This recording was followed by the CAT5 tropical cyclone Fantala in April 2016.26 A sustained occurrence of CAT5 tropical cyclones has thus been experienced following the late initiation of these very intense storms, with a slight yet statistically insignificant increase in frequency, particularly since 2010. Further monitoring of these storms should be conducted to enable a data set sufficiently large for statistical significance in trends to be determined. 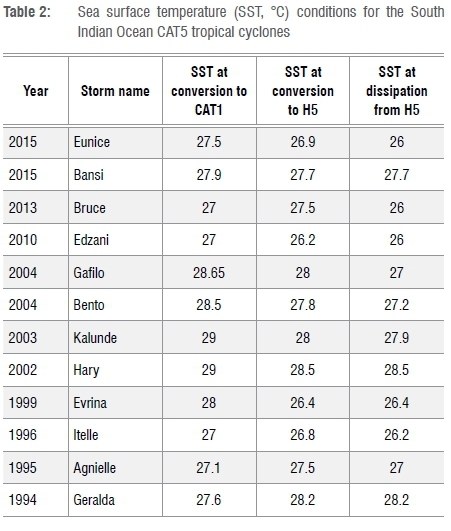 The 12 CAT5 tropical cyclones recorded for the South Indian Ocean do not provide a sufficient sample size for statistically significant time trends to be detected. 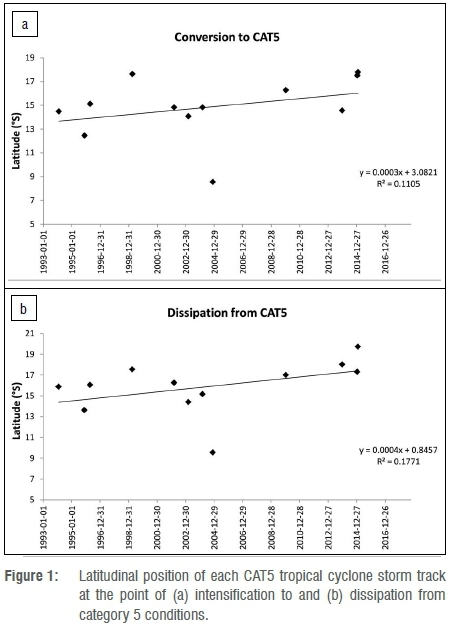 However, the latitudinal positions of the storm track at the time of conversion to and dissipation from CAT5 intensity both demonstrate a mean poleward trend over the period 1994-2015 (Figure 1). Notably this trend includes three of the four CAT5 tropical cyclones in the period 2010-2015 escalating to the highest strength at latitudes poleward of 16°S, and the two 2015 storms intensifying to CAT5 poleward of 17.5°S. The trend, although statistically insignificant for both intensification and dissipation, tentatively represents a poleward trajectory in CAT5 tropical cyclone intensification at a rate of 0.003°/decade (~0.33 km/decade), and dissipation at a more rapid rate of 0.004°/decade (~0.44 km/decade). The poleward shifts in the position of the storm track at the points of intensification to and dissipation from CAT5 occur concurrently with a poleward shift in the 26.5 °C sea surface temperature isotherm in the South Indian Ocean (Figure 2). This concurrence is significant because of the requirement for 26.5 °C sea surface temperatures for the cyclogenesis of tropical cyclones. The shift occurs at a mean rate of 0.068°/year (0.68°/decade) poleward for the ocean from a mean latitude of ~16°S to ~18°S over the period 1970-2015, with a more pronounced shift for the western half of the basin at a rate of 0.087°/year (0.87°/decade). For the majority of the ocean basin, this poleward shift is progressive decade on decade. However, between 50°E and 65°E, a reversal in this trend occurs for the decade 1990-1999 with the mean 26.5 °C isotherm positioned north of the isotherm for the decade 1980-1989. The poleward shift resumes for the periods 2000-2009 and 2010-2015, but the deviation for 1990-1999 is notable given the emergence of the first CAT5 tropical cyclone in 1994 at a longitude of 58°E. The slowest latitudinal shift in the 26.5 °C is recorded for the Mozambique Channel, albeit with all isotherm positions located poleward of those for the remainder of the ocean basin. Across the ocean basin, the most rapid isotherm shift experienced was for the shortest period, from 2010 to 2015. Although the threshold of 26.5 °C for sea surface temperatures is required for the genesis of tropical cyclones, the intensification of these storms requires additional energy supply, predominantly through latent heat. Such intensification also requires the limitation of factors that hinder cyclogenesis, most notably vertical shear. The sea surface temperature for the date and latitude of conversion from tropical storm to CAT1 tropical cyclone for all of these storms was higher than 27 °C, and was higher than 27.5°C in 8 of the 12 storms. For 9 of the 12 storms, the sea surface temperature was warmer at the point of intensification to CAT1 than at intensification to CAT5, and for all the storms, the sea surface was either the same or cooler at the point of dissipation from CAT5. A notable characteristic of all storms was that during the period of their activity, the 28 °C isotherm for the South Indian Ocean was positioned poleward of 9°S, and the 29 °C isotherm poleward of 3°S. This position is relative to a long-term 1950-2015 mean position of the 28 °C isotherm at 7°S. 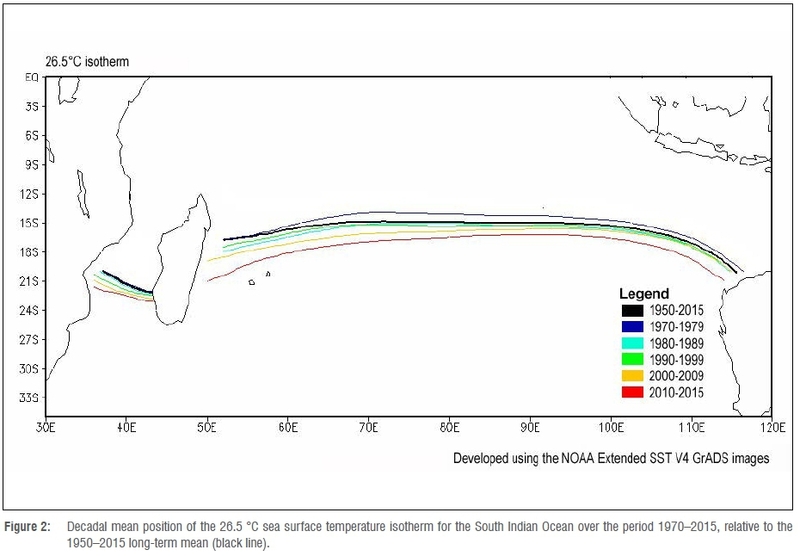 For the 29 °C isotherm, there is no long-term 1950-2015 mean position in the South Indian Ocean, with the first appearance of this isotherm in decadal means recorded for 1990-1999, notably coinciding with the first CAT5 tropical cyclone. Both the 28 °C and 29 °C isotherms demonstrate poleward shifts over the period 1970-2015, with the shift in the 28 °C isotherm occurring significantly more rapidly than the shift in the 26.5 °C isotherm. This study reveals two important findings regarding the changing characteristics of intense tropical cyclones in the South Indian Ocean. Firstly, prior to 1994, no tropical cyclones in the South Indian Ocean were classified, by the IBTrACS record, as having attained CAT5 intensity. Although it is arguable that early CAT5 tropical cyclones were not detected because of the low population density in the region and the lack of direct geostationary satellite data prior to 198916, post-1970 records globally have been largely standardised through satellite imagery to form the consolidated IBTrACS record. In the period 1970-1993, no tropical cyclones in the South Indian Ocean are recorded in the IBTrACS record to have intensified to CAT5, while such high intensity storms were recorded for other ocean basins. This 1994 record represents the latest global emergence of CAT5 tropical cyclones. Secondly, between 1994 and 2015, a total of 12 CAT5 tropical cyclones are captured in the IBTrACS storm track records. Four of these storms occurred between 2010 and 2015, with a more recent CAT5 tropical cyclone in 2016 demonstrating consistency in storm intensification post-1994, and a slight, albeit statistically insignificant, increase in the frequency of CAT5 storms over time. This increase is consistent with a trend in the proportion of storms attaining CAT4 or CAT5, but at odds with the frequency of CAT4 and CAT5 storms in the South Indian Ocean.16 This is a feature of a more rapid decline in CAT4 storms, potentially representing a greater percentage intensifying from CAT4 to CAT5 wind speed and central pressure. Because of the low number of storms to date, the sample size is too small to detect any statistically significant trends. However, a poleward shift in the position of the storm track at intensification to and dissipation from CAT5 intensity is demonstrated through these 12 storms, concurrently with statistically significant poleward shifts in the 26.5 °C, 28 °C and 29 °C isotherms. These trends should be closely monitored to determine whether they represent persistent, long-term climatic change that supersedes inter-decadal patterns. The findings of this study rely heavily on the accuracy of the NOAA IBTrACS storm track database in capturing the intensity and latitudinal position of these CAT5 cyclones. These records provide an important global record of tropical cyclone activity, compiled for the period 1841-2015 through a combination of ship logs and land-based records for the early decades, and aerial reconnaissance and satellite imagery in more recent years.25 The record includes the storm track followed by the tropical cyclone, the intensity of the storm, and the factors from which intensity is derived: central storm pressure and wind speed.27 Concerns have been raised in the literature regarding the scientific accuracy of these records, and in particular issues of data heterogeneity as a result of the changing methods of storm identification and measurement.16,28,29 There is some consensus that records from 1970 onwards are relatively accurate because of the use of geo-orbiting satellites that provide constant monitoring across the global oceans, rather than the more sparse coverage temporally and spatially of passing ships or individual aeroplanes on reconnaissance missions, but concern has been raised that for the Indian Ocean, direct geo-orbiting satellite data were not available prior to the launch of Meteostat-5.11,16,27 Further efforts have been introduced to increase the accuracy of these records and their reanalysis data, with significant improvements reported27, and the IBTrACS records are now endorsed by the World Meteorological Organization30. Furthermore, it is argued that the record is most accurate for storms at their maximum intensity: the storm has been in existence sufficiently long to be detected and monitored independently, and a greater impetus is placed on accurate recording as the storm develops a greater destructive potential.11 Thus for the purpose of this study, which focuses exclusively on CAT5 tropical cyclones subsequent to 1989, the record is taken to be sufficiently reliable for calculating the findings presented. CAT5 storms, which had not previously been recorded for the basin, occurred more frequently in the period 2010-2016 than in the previous decadal periods of 1990-1999 and 2000-2009. The Intergovernmental Panel on Climate Change has long suggested that climate change would result in an increased frequency and intensity of severe climatic events.1 For many of the world's ocean basins, trends over the past century have demonstrated little change in tropical cyclone numbers, and for regions such as the southwest Indian Ocean and West Pacific Ocean, a decreasing trend has been observed.8 This trend occurred concurrently with a 0.3 °C increase in mean global sea surface temperatures, which would encourage tropical cyclone formation.7 While it has been suggested that the intensity of tropical cyclones is increasing because of this warming trend, CAT5 storm dynamics have not previously been examined in isolation.11,15 The increase in the frequency of occurrence of CAT5 storms, particularly for a region that did not previously experience very high intensity tropical cyclones, demonstrates the manifestation of the sea surface temperature warming on tropical cyclone systems. This increase in frequency coupled with a net reduction in cumulative counts of CAT4 and CAT5 storms16 demonstrates that the storms previously terminating at CAT4 intensity are instead increasingly reaching CAT5 intensity - a feature further reflected in the increase in the percentage of CAT4 and CAT5 storms as a subset of all tropical cyclones, both in the South Indian Ocean and globally. The warming trend in sea surface temperatures has resulted in a poleward shift in the South Indian Ocean 26.5 °C isotherm required for tropical cyclone formation, at a statistically significant mean rate of 0.68°/decade (p<0.0001). More rapid is the poleward shift in the 28 °C isotherm, and the appearance and poleward migration of a 29 °C isotherm in the South Indian Ocean over recent decades. These changes are occurring concurrently with a poleward shift in the latitude of the storm track position at the points of intensification to and dissipation from CAT5 for the 12 storms on record. Moreover, a distinct relationship appears to exist between the position of the 28 °C and 29 °C sea surface temperature isotherms and the probability of occurrence of CAT5 storms, as each of the recorded storms has occurred under conditions in which the 28 °C isotherm is positioned south of 9°S latitude. These findings regarding the concurrent shifts in the 26.5 °C, 28 °C and 29 °C isotherms and the latitudinal position of CAT5 storm tracks, and the sea surface temperature distributions characterising CAT5 storms, are important for future projection of storm trajectories and intensities, and for the shorter-term forecasting during the lifespan of a storm. These results provide a concerning outlook for the South Indian Ocean. The region comprises a number of economically developing countries and small island states, which cannot afford large capital investment in infrastructural adaptation measures to mitigate against the threats of tropical cyclones.23,24 Unlike the United States of America, which experiences numerous tropical cyclones making landfall in any given year, only 5% of the ~9 tropical cyclones that form in the western half of the South Indian Ocean basin make landfall in any given year.8 However, all of the storms that make landfall have devastating impacts on the livelihoods, habitat, economy and natural environment of the country affected.24 Thus, the threat of increasing proportions of the highest intensity tropical cyclones, even under scenarios involving an absolute reduction in storm numbers, is therefore potentially devastating. Furthermore, the poleward trajectory of these storms indicated by the 12 CAT5 tropical cyclones that have been recorded thus far, and global studies indicating a poleward trajectory in the lifetime maximum intensity of tropical storms11, pose a heightened threat for South Africa. Although the South African coastline is currently protected from tropical cyclones by Madagascar, this southward trajectory has the potential to heighten the proportion of storms tracking south of this island nation which currently takes the brunt of tropical cyclones in the South Indian Ocean.8,24 As one of the most economically important countries in sub-Saharan Africa, even infrequent storms pose the threat of catastrophic damage23 for South Africa. High intensity storms would not only increase the potential for damage through the heightened wind speeds and rainfall24, but storms of higher intensity additionally have a wider storm radius, increasing the region of damage on landfall. Considerable further monitoring of tropical cyclones in the region is warranted to confirm the trends identified from the IBTrACS storm track and GrADS V4 sea surface temperature imagery, and incorporate the findings into climate modelling efforts for the region. This work was supported by a Society of South African Geographers Centennial Award for Emerging Career Researchers.